The most common types of burn are those from dry heat (for example, stove or iron burns), and those from hot liquids, which are known as scalds (for example, kettle burns from steam). There are also burns caused by chemicals, friction and radiation (including sun exposure), among others. Burns need to be treated carefully, according to their severity, appearance and cause. Superficial burns are red and sore, but usually without blistering, and can often be relieved quickly with topical treatment and an internal remedy if required. Partial thickness or second degree burns, affect deeper layers of the skin (dermis), and there is typically swelling and blistering, along with more intense pain. Full thickness or third degree burns affect the deepest layers of the skin and tissues beneath, and the affected tissues may be white or blackened, with no blistering and often no pain. In the case of more serious burns, seek medical care immediately. Severe burns can be life-threatening due to potential infection and shock, so do not delay. And always seek urgent medical care if a child receives a burn of any kind – if in doubt seek advice straight away. 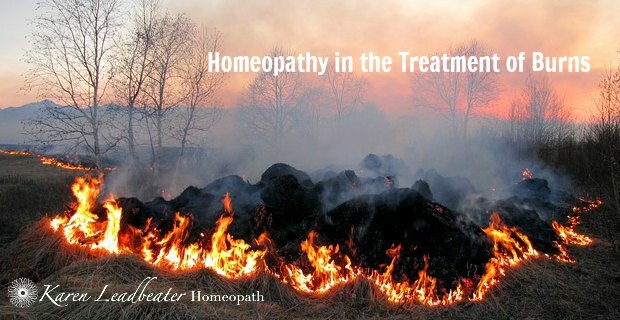 Homeopathic treatment has been shown to be of great value in the treatment of burns. If you have a remedy kit with a suitable remedy to hand, treatment can be administered on the way to the hospital, GP or walk-in centre. The right remedy will reduce pain and swelling swiftly, and promote healing. These are some of the main remedies used in the treatment of burns. Choose the one that most closely matches your symptoms. For further details on dosage and administration, see my free e-book My Top Ten Homeopathic Remedies. Calendula is often used in the treatment of first degree or superficial burns. Used topically as a lotion, it relieves soreness, prevents infection if the skin is broken, and promotes healing. Make a lotion by adding 10 drops of Calendula tincture to one tablespoon of cool boiled water, and use to bathe the affected area. Urtica urens is made from nettle, and is one of the main remedies used in the treatment of superficial burns, especially scalds, where there is redness and painful prickling and itching. Cantharis is an invaluable remedy for painful burns, and will reduce pain and swelling rapidly in most cases. Cantharis is suited to burns which are intensely painful, with redness and blistering. Repeat the remedy frequently ( up to every 10 – 15 minutes in a 30c potency to begin with), or take a further dose whenever the pain returns, and until pain and redness are significantly reduced. Causticum can be very helpful in more severe burns which are very painful and raw. It will also help in burns which affect the whole constitution (both physically and emotionally), and burns which take a long time to heal. Apis is used in the treatment of burns where the swelling and redness are marked. This might typically include scalds and sunburn. The area affected is tender and sensitive, and may have a waxy appearance. In more serious burns which are at risk of becoming infected, homeopathic treatment can also be effective, but this situation needs professional homeopathic care. Carbolic acid, Kreosotum and Lachesis are among the remedies a homeopath may prescribe in this situation. Homeopathy can provide relief in cases of radiation burns, including the after-effects of x-rays and radiotherapy. This situation would need individualised professional care, and among the remedies which a homeopath may prescribe are Radium bromatum, Phosphorus and Cadmium sulphuratum. Phosphorus is also the main remedy used in the first aid treatment of electrical burns. NB Electrical burns should always be seen by a doctor without delay, as they are often more extensive beneath the surface than they appear on the skin. Scarring can be a concern following a significant burn, and homeopathic support can help to minimise scar tissue once the wound has healed. Topical oils can be used to promote skin regeneration (consider rosehip or wheatgerm oil, for example), and a homeopath would prescribe individualised remedies in each case. These might include the remedies Thiosinaminum, Silica and Graphites, among others. 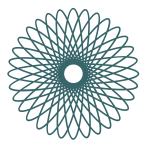 If you would like to ask my advice or discuss treatment, contact me here.